It has long been known that birds change their behaviour, reproductive performance and survival as they mature, including in the first few years after recruitment into the breeding population. However, and contrasting with the description of patterns of actuarial and reproductive senescence in later years, there are surprisingly few studies documenting changes in behaviour in old individuals. Such studies are important, as birds provide particularly interesting models for studying the biology of senescence. It has been suggested that, unlike mammals, birds may remain physically fit until an advanced age, yet this has limited empirical support. 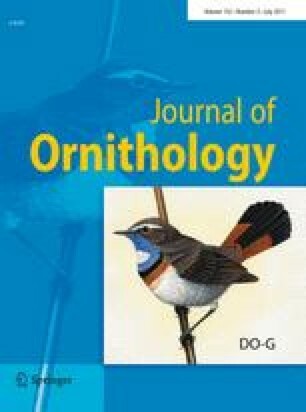 In this paper, we used activity (immersion) loggers to show that old (>26 years) Cory’s Shearwaters Calonectris diomedea are less active when foraging at sea, spend more time resting on the water and have a smaller number of take-offs and landings during darkness, when compared to experienced mid-aged individuals (13–20 years old). Old individuals also tended to have reduced immune response against an experimental challenge using phytohaemagglutinin. These results are in line with observed reductions in activity levels with age in a wide range of non-avian taxa, and may suggest that old seabirds are physically less fit than younger individuals. Alternatively, old birds might simply be more experienced and their reduction in activity might reflect a strategic regulation of investment in different activities. Our study illustrates the potential for gaining insights into avian aging patterns and processes by looking into the behaviour of model organisms. We therefore encourage more research focusing on behavioural parameters that may reflect variations in physical condition or strategic choices, during both the breeding and non-breeding seasons. Communicated by P. H. Becker. Es ist bereits seit längerem bekannt, dass sich das Verhalten, der Bruterfolg und die Überlebensrate von Vögeln mit zunehmendem Alter verändert. Trotz der Beschreibung solcher Muster von Sterblichkeitsund reproduktiver Vergreisung in späteren Jahren gibt es erstaunlich wenige Studien, die eine derartige Veränderung im Verhalten alter Individuen dokumentieren. Solche Studien sind wichtig, weil Vögel ein besonders interessantes Modellsystem für die Untersuchung der Biologie von Vergreisung darstellen. Anders als bei Säugetieren wurde vorgeschlagen, dass Vögel bis ins hohe Alter physisch gesund bleiben. Dies wird jedoch nur im begrenzten Maße von empirischen Daten unterstützt. In der vorliegenden Studie verwendeten wir Aktivitätslogger, um zu zeigen, dass 26-jährige Gelbschnabel-Sturmtaucher Calonectris diomedea weniger aktiv sind, während sie auf See furagieren. Sie haben kürzere Ruhepausen auf dem Wasser und eine geringere Anzahl Starts und Landungen während der Dunkelheit, im Vergleich mit erfahrenen mittel alten Individuen (13–20 Jahre alt). Alte Individuen neigten auch zu einer reduzierten Immunreaktion auf eine experimentelle Injektion von Phytohaemagglutinin. Diese Ergebnisse stimmen im Wesentlichen überein mit der beobachteten Abnahme von Aktivität mit zunehmendem Alter in einer großen Anzahl anderer Tiergruppen. Es kann sein, dass alte Seevögel physisch weniger fit sind als jüngere. Alternativ könnten ältere Vögel auch erfahrener sein, und die Aktivitätsreduktion könnte eine strategische Regulierung der Allokation von Investment in unterschiedliche Aktivitäten sein. Unsere Untersuchung zeigt, dass detaillierte Studien des Verhaltens von Modellorganismen das Potential haben, Muster und Alterungsprozesse bei Vögeln zu erklären. Wir regen deshalb mehr Verhaltensstudien an, die die Variation in der physischer Kondition oder verschiedene strategischen Entscheidungen reflektieren, und dies sowohl in wie außerhalb der Brutsaison. Parque Natural da Madeira, and particularly Dília Menezes provided permissions to carry out the work and, together with the wardens at the Nature Reserve where this study took place, gave important logistical support. Hany Alonso, Rafael Matias, Maria Dias, Miguel Lecoq, Rui Rebelo, Filipe Moniz, Ana Leal, Ricardo Martins and others helped with fieldwork. The manuscript benefited from the comments of two anonymous referees. This study is an output from a project on the ecology and senescence in Cory’s Shearwaters (PDCT/MAR/58778/2004) supported by Fundação para a Ciência e a Tecnologia (FCT—Portugal) and FEDER. P. Catry benefited from postdoctoral fellowships from FCT (BPD/11631/02 and SFRH/BPD/30031/2006) and further support was received through Programa Plurianual (UI&D 331/94).